Samsung WiFi oven can be controlled with Android app | Android Blast! 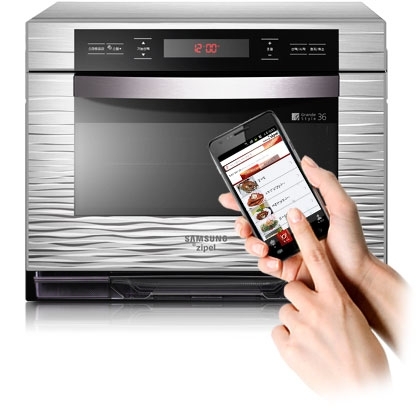 Samsung has released the Zipel, and oven with built-in WiFi that can be controlled with an Android app. The Samsung MC368GAAW5A is a ceramic oven that works with a proprietary Android app. The app allows the user to pick from 160 different presets for specific dishes. Once the user picks the dish in the app, the data is sent to the oven and the temperature and time is automatically set. In addition to the presets, the Zipel oven can tell you how many calories the food you�re preparing has, and even how much it weighs. Unfortunately, the Zipel is only available in Samsung's home country, Korea. I'm sure more appliances like this will make it around the world soon though.